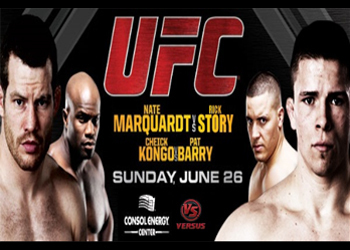 “UFC on Versus 4: Kongo vs. Barry” takes place Saturday night inside the Consol Energy Center in Pittsburgh, Pennsylvania. Yes, you did read the show’s title correctly and please ignore the official event poster depicted above. Nate Marquardt was scheduled to headline the freebie fight card against Rick Story, but the newly-turned welterweight failed his physical and was pulled from the show just minutes before yesterday’s weigh-ins. A heavyweight scrap between Cheick Kongo and Pat Barry will now serve as the night’s featured attraction. Story now co-headlines against Charlie Brenneman. The UFC’s Facebook page kicks off the festivities with a live stream of all seven preliminary bouts at Facebook 6PM ET/3PM PT. Versus will broadcast the main card immediately after beginning at 9PM ET/6PM PT. We’ll be tweeting the live play-by-play and results in the blue Twitter box below. Please keep refreshing this page for the latest action or follow @5thRoundResults on Twitter to get the info directly.